As summer approaches, most people spend more time outdoors; and with that comes the chance of developing a poison ivy allergy. Seven out of 10 people are allergic to poison ivy, making this the world’s most common allergy. 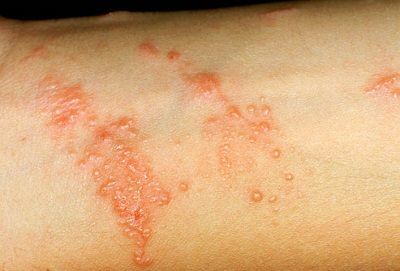 Symptoms of allergies from poison ivy appears within 12 to 48 hours after exposure, include extreme itchiness accompanied by red patchy rashes found on the parts of the body, which touched the plant. Symptoms may worsen at day four to seven, and rashes may last for one to three weeks. Although the only way to completely remove the rash is time, there are several simple home remedies for poison ivy to reduce itching and spreading. An excellent home remedy to relieve itching from poison ivy allergy. Make a paste consisting of 3 parts baking soda to 1 part water and apply the paste to the affected areas. Leave the baking soda paste to dry, and allow it to crack or flake off. Another poison ivy home remedy is to soak in a cool bath with 1 cup of baking soda mixed in. Rinse with apple cider vinegar. With its many medicinal qualities, it’s no surprise that apple cider vinegar has also been shown to be a powerful poison ivy home remedy. First, wash the affected area with soap and lukewarm water, then rinse. Apply vinegar with a cotton ball, rub gently, and rinse. This can relieve many skin reactions, including plant allergies and insect bites. You can also mix a paste of goldenseal powder and water or apple cider vinegar and apply to the rash to protect against infections. Banana peels are a great homemade remedy for itchy skin. It helps to cool and soothe the area. Simply rub the inside of a banana peel on the affected area. Similar to the banana peel, watermelon rind is also cold on the skin and can help provide itch relief for the poison ivy rash. Bathing in lukewarm water mixed with oatmeal may help dry oozing blisters and soothe irritated skin. Simply grind 1 cup oatmeal in your blender until it is a fine powder and add it to your warm bath water. Avoid using water that is very hot, especially right after being exposed to the poison as this will open your pores. In addition, you can cook a small amount of oatmeal and apply it directly to the rash as a paste. An ancient curative remedy for the skin, slice a leaf of a fresh aloe vera plant, scoop out the gel, and apply to the affected areas. Aloe vera gel helps treat poison ivy rash through its anti- inflammatory constituents. Allow the gel to dry and wash off. You may reapply this every 2 hours. Rubbing alcohol, like other cures, works best when used as soon as possible after contact with poison ivy. This works because the alcohol will wash away the urushiol oil, the allergen in poison ivy and oak that causes the itchiness. In a pinch, a high-proof alcoholic beverage can be instead of rubbing alcohol to sterilize the area and help prevent infection. If you’re really out of luck, and don’t have access to any alcohol or food, you can try coffee as a last resort. Coffee is known to contain chlorogenic acid, which has anti-inflammatory properties. Pour 1 cup of cold coffee over the affected area and let it soak in. Make sure your coffee is completely cooled before using it. This coffee cure hasn’t been proved, as there haven’t been any studies done on it. Never burn poison ivy, poison oak or poison sumac to get rid of it. The oil is vaporized and if inhaled, can cause the rash on lung tissue resulting in respiratory failure in extreme cases. If you have a rash in your eyes, mouth, nose or genital area, or if the rash covers a very large area of the body, then you should consult your doctor. Also, see your doctor if the discomfort is not relieved by home treatment.